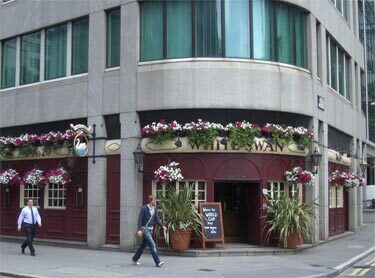 The White Swan sits on the ground floor and lower ground floor of the office block at 20 Farringdon Street. This is a good sized pub, they usually have two ales available, on my visit the IPA was pretty good. Service was fine and as with most City pubs gets busy on Thursday and Fridays but lunchtime and evening, outside of those times you will find it quiet. Farringdon Street was originally built in 1738 upon arches so as to lift it several feet about the River Fleet which still runs today through a sewer under the modern Farringdon Street. The name Farringdon comes from a City merchant William Farindon who purchased this ward in 1279.